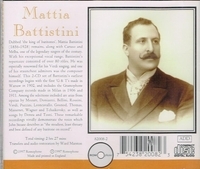 "Battistini's recordings are such exemplars of fine singing that it is hard to pick out individual instances of excellence....What is evident from the records is that he was a vocal actor of the highest quality, defining character and situations closely in terms of tonal nuance....Such artistic completeness is rare, affirming Battistini's status as one of those singers whose complex, searching interpretative powers merit the fullest exploration." "They're very collectable, these Romophone complete editions. Up they go on the shelves, and you know that there is another small but quite important area in the history of singing on records properly covered, ready for reference at any time, and reference that will be a pleasure because the standard of transfer is so reliable."